The July jobs report showed employment growth remaining strong. The U.S. Bureau of Labor Statistics showed employment increased by 255,000 jobs in July, surpassing economists’ expectations of 182,000 new jobs. This marks the second month that job growth has been significantly stronger than predicted. The unemployment rate remained unchanged at 4.9% in July. 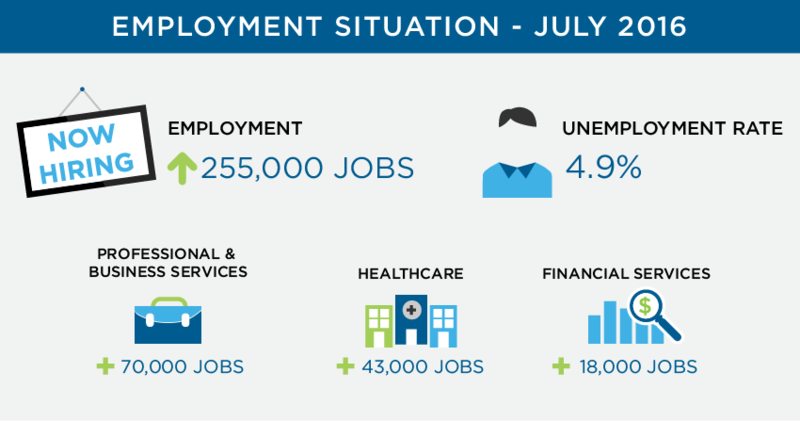 In July, professional and business services added 70,000 jobs, healthcare employment increased by 43,000, and employment in financial activities rose by 18,000. Temporary jobs rose 17,000 in July for a total of 2.93 million temporary jobs, the largest level since December. Professional and business services added 70,000 jobs in July, with 37,000 of the jobs gains occurring in professional and technical services. Over the past 12 months, professional and business services has added 550,000 jobs. Erika Baumgartner, Account Manager for the Technology and Engineering Division in Las Vegas, has seen an increased demand for systems engineers. Healthcare employment increased by 43,000 jobs in July, with 19,000 of the job gains occurring in ambulatory healthcare services, 17,000 in hospitals, and 7,000 in nursing and residential care facilities. Over the past 12 months, healthcare has added 477,000 jobs. Kristin Carpenter, Director of Operations in San Diego, commented on the increase, “Our Healthcare Division has seen an increased number of clients requesting short-term temporary and per diem workers. The growth in the Healthcare industry has been so dynamic over the last few months that additional work cannot be covered with internal staff any longer. As a result, this work has now been outsourced to temporary and per diem workers. Employment in financial activities rose by 18,000 in July and has risen by 162,000 over the year. Evan Levine, Executive Recruiter of the Finance & Accounting Division in San Diego, commented on the increase, “With more competition for top talent in Finance and Accounting, candidate engagement is more important than ever to the recruitment process. The unemployment rate held steady at 4.9% in July as more people joined the labor force, actively seeking work. Revisions to May and June employment gains showed that 18,000 more jobs were added than previously reported. As a result of strong employment growth, companies should increase their efforts to retain top talent and streamline hiring processes. Companies who choose to disregard candidate needs and experience throughout the hiring process risk the chances of losing top candidates during all phases of the hiring process. Find out what gaps exist in your current hiring process with our Talent Acquisition Assessment results. Stay ahead in today’s labor market and contact us to learn how Eastridge can help you find the candidates you are looking for.